I Walked with a Zombie, one of a series of memorable films produced by Val Lewton in the 1940s, is now something of a cult horror classic. The film was directed by Jacques Tourneur and edited by Mark Robson, who would soon be the director for the Lewt on-produced The Seventh Victim. To many people (including me), it’s not typical of the horror genre, but however it’s classified, I think it’s one of the all-time great films and certainly Lewton’s best. What makes the film profound (and demonstrates why cinematic expression can be more powerful than textual) is the way it directly evokes and prods us about our most unspeakable fears. Wesley Rand, Paul’s younger, half-brother. Mrs. Rand, the mother of Paul and Wesley. The story can be divided into five basic sections or acts, although there is no strict demarcation indicating these divisions. I. Arrival. Betsy comes to the West Indies and meets the two brothers and Jessica. 1. The film opens in Ottawa, Canada, with nurse Betsy Connell being recruited in an agency office for an overseas nursing assignment. Her interviewer tells her that her future employer is a big sugar planter in the West Indies. Then he asks her, without explanation, if she believes in witchcraft, and Betsy laughingly dismisses the idea. This first scene is bright and sunny. 2. A moody night time scene on a sailing ship with very atmospheric lighting. Black sailors on the ship are singing a mournful song. We hear Betsy in voice-over describing her recollections of this sailing experience to her West Indian destination. This sets us up for the feeling that the entire film is a recollection of events in Betsy’s past. She says that she met Paul Holland in Antigua and is now sailing with him to Fort Holland on the island of St. Sebastian. The voice-over indicates that she was silently reflecting that the night is beautiful, when Paul interrupts, in live action, saying, “it is not beautiful.” He tells her that in this part of the world, “there is only death and decay. . . . Everything good dies here”. Back to voice-over, Betsy recollects that she saw something good in Paul – she’s attracted. Already, we have the contrast presented between the sunny, optimistic spirit of Betsy and the dark, melancholy feelings of those around her. In addition, there will be an ongoing confrontation in the film between two contrasting world-views: the rational, perspective reflecting Western empirical science and the European Enlightenment (label it here, “E”, for European) and the dark world of evil spirts and magic (label it “V”, for Voodoo). “E” fuels our dreams; “V” inhabits our nightmares. As things develop, Paul is resolutely rational, though haunted by his own personal demons, while Betsy, Wesley, and Mrs. Rand are variously seduced by the lure of Voodoo. I will label the dominant mood of most of the upcoming scenes. This one is mixed: E+V. 3. Ship disembarking scene (E), which is again bright and sunny. Here, there is a nice tracking shot, as Betsy gets off the boat and walks through town. There’s no indication of any motorcars in this film, only horse-drawn carriages, and there are no telephones or other signs of modern life in the film. Later on, however, we do see a flashlight, which puts the film into more or less contemporary times. Betsy walks to a horse-drawn carriage and gets in. 4. Carriage drive to the plantation, during which the driver gives Betsy some background information (E+V). He tells her that the Holland family is the oldest family and that they brought the coloured folks and “Ti-Misery” to Saint Sebastian. Betsy soon figures out that “Ti-Misery” was the figurehead of the slave ship that brought black people to Saint Sebastian, and it is now installed as a statue in the front garden at “Fort Holland”. The driver says that that ship “brought the long-ago fathers and the long-ago mothers of us all, chained to the bottom of the boat.”. Betsy, oblivious to the driver’s gloomy words, says “they brought you to a beautiful place.” The driver responds, with polite resignation, “if you say, Ma’am.” Here, again, we have a slight further confrontation between the joyful optimism of Betsy and the other possibilities that the world can offer us. The stature of Saint Sebastian, which shows the martyred saint in the traditional form as shot with arrows, will remain an ambiguous symbol. From one perspective, it's a symbol of Western beliefs, but the black people of the island see it as symbol associated with their own world of inexplicable suffering. 5. The camera tracks through the empty rooms of the Holland mansion, as Betsy, in voice-over, recollects how each of the rooms came to have great meaning for her (E). 6. Betsy meets Wesley for the first time, and he describes the Holland family. Wesley is obviously trying to charm the pretty nurse. During their conversation, we hear the distant sound of ethnic drums beating, which reminds them of the native world, with its different practices, outside their dwelling. Paul then enters, and Wes departs. Paul takes dinner on a platter to his wife (Jessica), and tells Betsy that she will be introduced to his wife, the person she has been hired to care for, the next day (E). 7. Betsy in her room at night (V), sees through her window a strange woman (later we know that this is Jessica) walking in the darkness. Betsy also hears a crying sound outside, puts on her gown, and goes outside into the yard. There, she comes to a “tower” building in the compound, which she enters and sees a mysterious staircase, which she begins to climb. The strange, tall woman (Jessica), in long flowing white robes, arrives and climbs the same staircase and then wordlessly approaches Betsy. Betsy screams in terror as Jessica comes closer. This is our first sight of the ethereal Jessica, a role beautifully played by Christine Gordon in her only credited movie performance. Jessica will not utter a word in the film and will only unblinkingly stare off into the distance. Paul and black servants arrive, and they tell Betsy not to be afraid. Jessica is led away, and Paul explains to Betsy that the crying sound that she heard is typical for the black people at the birth of a child (which was taking place elsewhere that night). He tells her that these people, with a history of misery from their lives of slavery, always weep when a child is born and make marry at a burial, because their lives are sad. 8. Morning, the next day (E). Alma, a black maid, comes and wakes up Betsy, and during their conversation tells Betsy that Jessica is “mindless”, although she can walk and will obey simple commands. Later, when Betsy is dressed, she meets Paul in the house. He tells her that this is not a place for a frightened girl, but she assures him that she is a medically-trained professional and is not afraid of the dark. Nevertheless, Paul warns her about the superstitions of the villagers. 9. Betsy with Dr. Maxwell, who explains more about Jessica’s catatonic condition (E). He says that Jessica is incurable. Then Betsy runs into Paul, and they engage in some small talk, but Paul appears negative and sour. 10. Betsy goes to the bustling town, and runs into Wesley (E), who again tries to charm Betsy. In the market, we hear the calypso singing of Ti-Joseph (played by Lancelot, a famous calypso musician of that time). While Wesley tries to flirt with Betsy, he reveals that he is a heavy drinker, which draws polite scolds from the medically-trained and level-headed Betsy. They overhear, Ti-Joseph now singing a song about the history of the two Holland brothers. The song relates that there was a fight between them over Jessica. She wanted to run away with Wesley (according to the song), but Paul said, no, “and that’s when the trouble start”. When Lancelot sees Wesley, he interrupts his song and apologises to Wesley, but Wesley is abusive and then speaks highly critically of Paul to Betsy. Later at night (V) at the same café table, now in shadows and with Wesley passed out from his drinking so that only Betsy is there to hear, Ti-Joseph finishes his song and reveals more of the history of the Holland family. Ti-Joseph seems to be more than a singer in this scene and something like a Greek chorus speaking the dark voice of fate. 11. The mother of Holland brothers, Mrs. Rand, who is a widow, makes an unexpected appearance (the first of many) and explains herself (E). She works as a missionary/doctor and doesn’t usually stay at the Holland mansion. Mrs. Rand helps get the drunken Wesley onto a horse to go home, and then she asks Betsy to tell Paul to remove whiskey from the dinner table in the future in order to help Wesley with his drinking problem. On returning, Betsy does ask Paul about this, but he refuses and tells her to mind her own business. 12. Dinner at night, with the sound of distant drums and the blowing of a conch. Paul explains that the blacks are trying to invoke their gods to end a drought. They are having a cermony at the houmfort, which is their Voodoo temple. Wesly complains that there is no whiskey at the table (so Paul has agreed to Betsy’s request), and then he quarrels more with Paul and angrily says that everything that happened back then was Paul’s fault. Later in the evening, with Paul at the piano, playing romantic classical music, Betsy approaches to listen. Paul, revealing more about himself, talks about that famous night when Jessica wanted to run away. “I told her I’d keep her here by force, if necessary.” But the sound of the Voodoo drums intrude again, and Paul grows distant and departs. Betsy at the seashore at night. Again the voice-over: she says that moment at the piano was when she knew that she loved Paul. She resolves, our of her love for Paul, to restore Jessica to him. III. Betsy tries a desperate measure. 13. The next day (E). Dr. Maxwell proposes dangerous insulin shock treatment for Jessica, in the hopes it might wake her up. Paul reluctantly agrees to the treatment. But later that night, we see that the treatment has failed to have an effect. Paul and Betsy, both sad, show some tenderness towards each other. Then Wesley, bitter and jealous, appears and, after Betsy departs, accuses Paul of falling in love with Betsy. 14. The next day, Alma is seen with the new baby (born to her sister). It is a scene of general joy and laughter. Later, Alma, now walking alone with Betsy, says that witch doctors (Voodoo houngans) are more powerful than Western doctors and can cure Jessica. 15. Later, Mrs. Rand and Betsy talk about Voodoo. Betsy asks if Voodoo has “power”, and Mrs. Rand expresses surprise that a nurse would even ask that. She warns Betsy not to go to the houmfort, because these people are primitive and unpredictable. 16. It is now nighttime (V). While Paul, Wesley and the household are still awake, Betsy sneaks out of the house, leading Jessica by the hand. Alma meets her privately at the gate and traces out a map in the sand. She tells her that she will meet Carrefour, who guards the houmfort. To get past Carrefour, Alma gives Betsy and Jessica Voodoo patches that will signal Carrefour to let them pass. 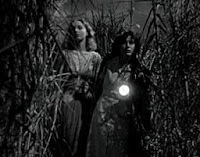 Betsy and Jessica set out on their famous night walk through the sugar cane field. It lasts 4:10 and is one of the most mesmerising scenes in film history. The ghostly Jessica, dressed in white and staring sightlessly sideways, is about a head taller than the fearful, but determined, Betsy, dressed in dark clothing. They walk past dead birds, sacrificed animals hanging from trees, and a human skull. There is no talking, only the sound of the wind blowing through the cane fields. Because the sugar cane is more than head high, Betsy and Jessica are walking though a mysterious labyrinth and are partially obscured sight by the cane branches. As they walk, Betsy’s Voodoo patch is accidentally scraped off of her garment by a branch, but Betsy doesn’t notice. They finally come to Carrefour, an extremely tall, gaunt and disturbingly glaring black man who is motionless and seems to be a zombie. They pass through (despite Betsy's missing Voodoo patch) and finally reach the houmfort. This is the passage into the innermost cave of the hero’s journey. 17. At the houmfort (V) there is a mysterious and haunting ceremony going on which lasts 3:30. We see wild, wanton dancing in front of the voodoo sabreur (a sword-wielding figure, perhaps something of houmgon, himself). Betsy sees that some of the black people approach the door of the houmfort and speak through a covered screen on the door, making requests to someone behind it. Betsy goes up approaches the door with her request for magic to cure Jessica, but she is quickly ushered through the door, only to learn that Mrs. Rand is there inside the room! Now Betsy is in the room, while Jessica is still outside the door with the madly and ritualistically dancing black people..
Mrs. Rand (E) scolds Betsy for seeking out Voodoo power and explains that she, herself, doesn’t believe in Voodoo – she only goes to the houmfort and participates in their rituals in order to help the black people. They seem to listen to her counsel, she tells Betsy, if they think she is on the side of the Voodoo gods. She reassures Betsy that Jessica is scientifically incurable. So Mrs. Rand seems to be in control here, and the voice of scientific rationality has quickly regained pre-eminence. Meanwhile (V), the sabreur approaches Jessica and somehow, without speaking to her or touching her, compels her only with his gestures to raise her arms . The sabreur stabs Jessica lightly with the sword, but she doesn’t bleed. The black people become excited and start murmuring “Zombie!”. Betsy and Mrs. Rand now come out from the room, and Mrs. Rand, fearing things are getting out of her control, urges Betsy to take Jessica quickly back to Fort Holland for safety. Betsy and Jessica rush back through the sugar cane field. So Betsy’s descent into the cave of mystery has failed. She can’t cure Jessica, and she can’t help Paul, whether it’s with science or with magic. Voodoo is dismissed as primitive witchcraft. IV. Voodoo returns19. It is the next day (E), and Alma is tending a horse in the Holland compound front yard. She tells Betsy that it belongs to the police commissioner, who has come on urgent business. 20. Meanwhile native drums are heard again (V), and we see that a doll replica of Jessica is being prepared by the sabreur. This is the beginning of an extended parallel action between the houmfort and the Holland mansion. The focus from here on will switch back and forth between these two spheres of action and their associated the E and V perspectives. 21. Betsy puts Jessica to bed (E). Paul comes and reveals that the police came, because the black people have become aroused and are potentially uncontrollable. It appears that the blacks want to get hold of Jessica in order to carry out some sort of rituals for zombies. 23. Paul, alone with Betsy, tells her that the police want to take Jessica to Saint Thomas, and urges her to return to Canada (E). Betsy doesn’t want to go, but Paul says that he believes that he only destroys beauty, and confesses that he hurt Jessica. He says that he’s afraid of hurting Betsy and destroying her love. They embrace discretely. 24. Betsy is in bed that night, guarding the sleeping Jessica nearby. Carrefour’s shadow is seen, and the sound of his scraping feet is heard. Betsy wakes up and walks outside. Then she sees something and, frightened, hides in the shadows of the front yard. Carrefour walks slowly by. Paul now appears from his room and orders Carrefour to go away, but Carrefour approaches Paul menacingly and continues towards Paul, despite Paul’s orders. Luckily and just in time, Mrs. Rand shows up suddenly and orders Carrefour to return to the hounfort. Carrefour obeys Mrs. Rands order and departs. Again, the confrontation between the European world (E) and the Voodoo world (V) has ended with the European world in control. 25. The next day, Betsy says to Mrs. Rand that she is returning to Canada (E). Doctor Maxell and Wesly then enter and announce that there will be a police investigation about Jessica’s circumstances (this had already been foretold by Paul), because of the native unrest. Wesley expresses satisfaction, saying maybe Paul’s evil actions will finally be revealed to all. But Mrs. Rand, intervenes and confesses to everyone that Jessica really is a zombie (in its Voodoo-understood way). She explains. At that time when Jessica planned to run away with Wesley, Mrs. Rand says that she was overcome with concern for her family breakup and ran to the houmfort, where she entered the Voodoo ceremony and pretended to be possessed. But, now she knows that she really was possessed, and didn’t realize it. In that ceremony at the houmfort, she asked the houmgon to make Jessica into a zombie. When she returned home, she learned to her horror that Jessica was raging with fever. So Jessica feels that she caused Jessica’s becoming a zombie. But Dr. Maxwell now speaks up to contradict her story. He says it is well-known that one has to kill a person first in order to make him into a zombie. Since Jessica was not killed before her sickness, he says, it follows that Mrs. Rand’s story doesn’t hold water, even on Voodoo terms. He reminds them that there was no indication of prior death, “there was no coma, nothing.” (We later learn, however, that this claim of absence of coma is untrue.) Mrs. Rand appears to accept Dr. Maxwell’s scientific rationalisation of what happened. 26. Back at the houmfort in the evening (V) and to the sound of ritual drum beating, the sabreur is seen attracting the Jessica doll toward him as it is pulled by a string held by the houmgon. 27. Jessica is seen walking in the darkness by herself toward the compound gate (V). Paul and Betsy see her and give her orders to turn back. Unusually this time, she does not obey verbal commands from Paul and Betsy to turn back, so they lock the gate, and Jessica, unable to open the gate, is stalled. Cut to the sabreur, whose symbolic attraction of the Jessica doll towards him is also stalled. 28. Continuing with the action at the compound gate, Wesley shows up and says that Voodoo has strange powers and that Jessica must be attracted by some Voodoo calling. Wesly says that the Voodoo can make people do anything. Paul dismisses this as nonsense and says that just because Dr. Maxwell didn’t know about the fact that Jessica really did have a coma doesn’t mean that his main argument against Voodoo was wrong. 29. Betsy going back to her room, sees Wesley, who asks her to kill Jessica and “make her free”. Wesly says that Jessica is already brain-dead, and that euthanasia would be an act of mercy. Jessica refuses, saying that her nurse’s commitment is to preserve life, not end it. Then she retires for the evening. 30. But Jessica is again seen walking alone toward the gate (V). Back at the houmfort (V), the Sabreur is seen whispering something into the ear of the houmgon. 31. Wesley, now in something of a trance, gets up and opens the gate for Jessica (V) enabling her to walk out of the compound towards the houmfort. He then goes to the statue of the martyred Saint Sebastian and pulls out one of the arrows. 32. At the houmfort (V), the sabreur is shown stabbing the Jessica doll. Cut to Wesley, who has just finished stabbing Jessica to death. Carrefour appears and watches. Wesley picks up Jessica’s body and carries it to the seashore and then wades out into the ocean. Carrefour is seen holding his hands outward (it is unclear whether this gesture indicates that he wanted to retrieve Jessica’s body from Wesley or he was commanding Wesley to enter the ocean). 33. Cut to a medium close-up scene of black spear fishermen at night wading in the water (V) and singing the same dirge-like song that was sung on the boat at the beginning of the film. They discover Jessica’s drowned body in the ocean. We learn that Wesley has also drowned. 34. A voice-over is now heard that is utterly new (V). It is the voice of an island black person, a Voodoo spokesman, who says in a soothing voice with an air of finality that the woman was wicked and already “dead in her spirit”, because of her selfishness: “her steps led him [Wesley] to evil.” The Voodoo perspective has now completely taken over even the narrative oversight of the film. Betsy’s European-oriented narrative voice-over has vanished. Paul and Betsy are seen sadly embracing (discretely), consoling each other. And so it ends. Everything that happened can be rationally and scientifically explained according to the European perspective. A woman, Jessica, suffered spinal paralysis because of a tropical fever. She was later killed by her grief-stricken and deranged lover, who then killed himself. No magic needs be invoked to account for all the events of the film. At the same time there is much that is left unexplained. We do not understand the rationale behind things, and yet when we watch this film, we recognise our own nightmares.